Oliver and Oscar, or is it Oscar and Oliver? 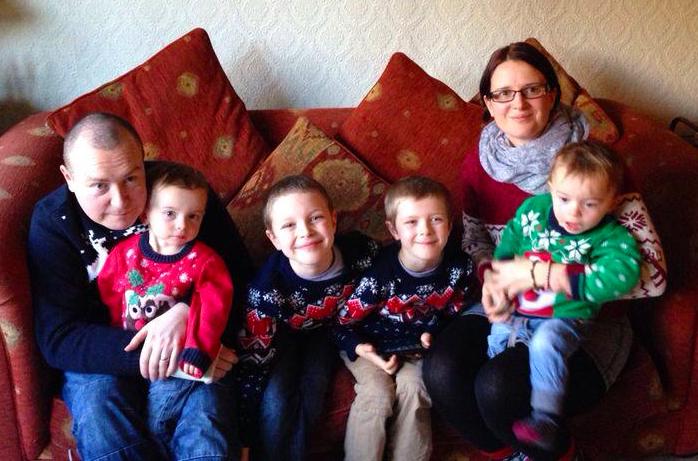 When John and Liz O’Neill were told they were going to have twins they were over the moon. During their scans they found out the twins were developing inside separate amniotic sacs, and as a result were told by the medical staff they would be non-identical. 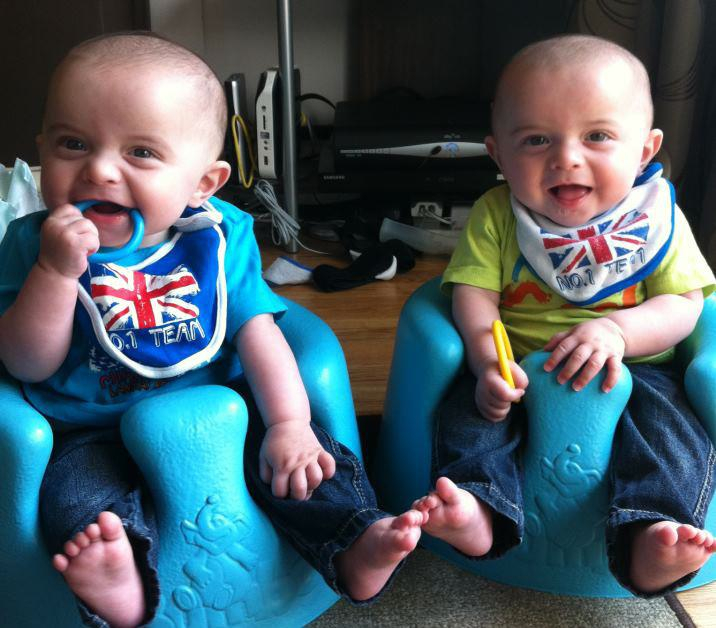 The adorable Oscar and Oliver were born on 9th February 2012. Both parents were understandably smitten, but also amazed at how alike the tiny siblings were. Shortly after the boys 1st birthday, while reading an article on twins, Liz discovered that it was actually possible for identical twins to develop in separate sacs if the egg splits very early on during development. With this new information and a sneaking suspicion that their initial instincts had always been right, Liz contacted PlayDNA to ask for help. “I went to school with Sam, and knew through facebook that she had started a business creating DNA artwork with meaning. I thought her forensic artwork might offer some clue as to whether Ozzy and Olly were identical or not” said Liz. We agreed to help, and took samples of DNA from each family member, including the twins older brothers Jack, age 8 and Josh, age 5. Dr Sam prepared a bespoke piece of artwork for the family, which looked at ten different genes related to particular traits, such as eye colour, memory and whether you’re more likely to be an early bird or night owl. The results were pretty conclusive. 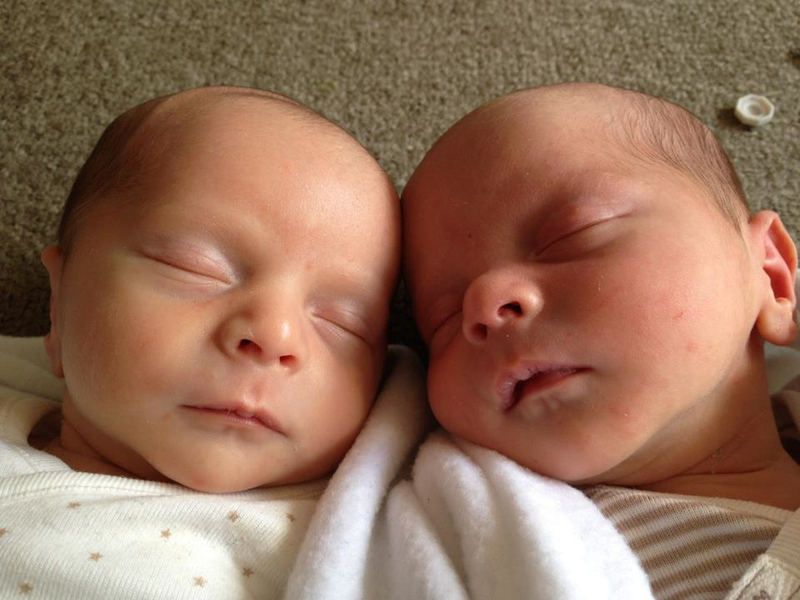 “Olly and Ozzy shared all ten genes in common – which combined with their amazing likeness is a sure sign that they are actually identical twins!” says Dr Sam. “This is made more apparent when we see their DNA portraits alongside their elder brothers, who very obviously have several differences in their DNA. We calculated the odds of them sharing these genes by coincidence, and it works out at 0.39% – in other words, less than a 1 in 200 chance. 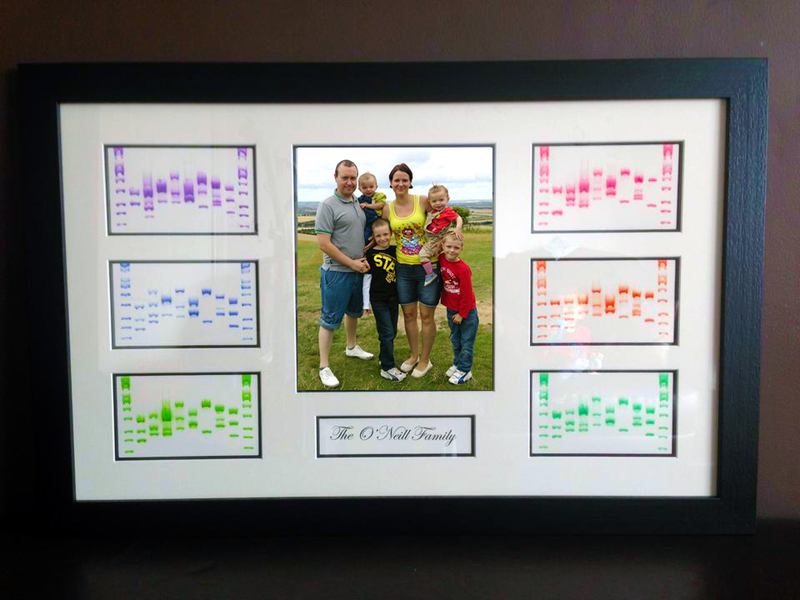 The O’Neill family now has their colourful DNA portraits framed and on the wall for all to see. Mum Liz told us: “Thank you so much for taking the time to explain what it all means despite being so busy. We really appreciate it. It was so interesting and is all we’ve talked about since. We’ve named ourselves team night owl and are putting together our owl names and power rangers style salute! The kids are loving it. We’re so excited about having the artwork in the house and being able to explain it properly to all our family and friends. It’s a brilliant thing for the kids to be able to grow up around and learn from. I just wanted to let you know how grateful we are”. 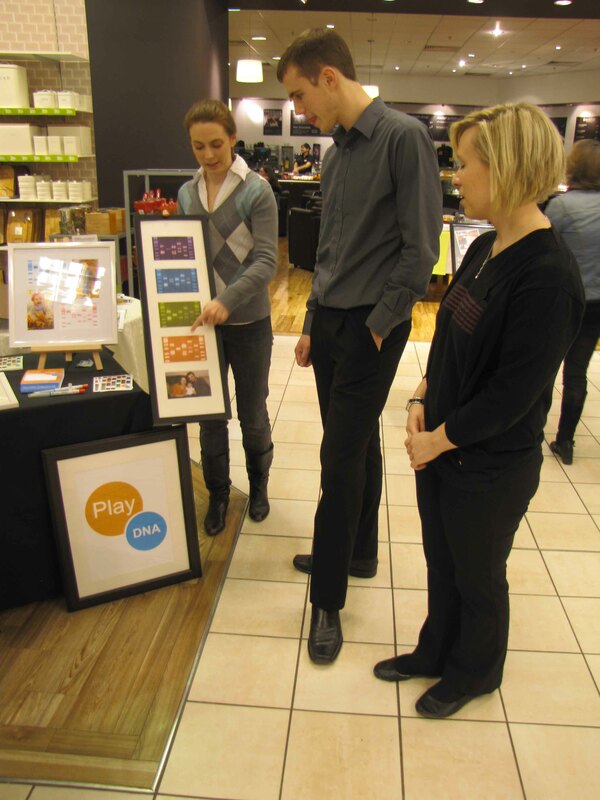 Personalised DNA art company PlayDNA will be on Dragons’ Den on Sunday 2nd February 2014 – tune in to see how they got on! Team Night Owl: the whole O’Neill clan! Dr Samantha Decombel, co-founder of PlayDNA, talks about the blossoming success of her unique DNA artwork company with Margaret Henry in this weeks Oxford Times In Business magazine. 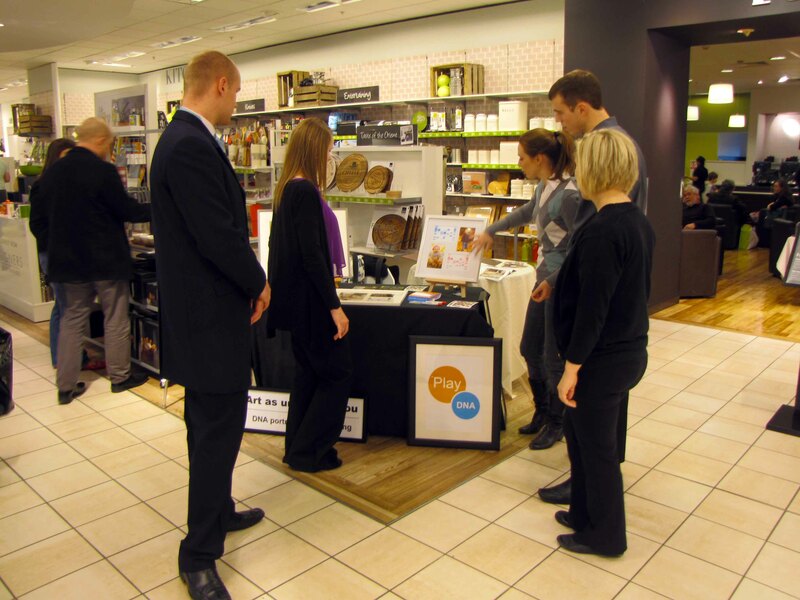 PlayDNA gets thumbs up from Debenhams crowd! After an overwhelmingly positive response to our first wedding fair at the 5* Randolph Hotel, Oxford, in January we were delighted to be invited to exhibit our new range of Framed Prints at the Debenhams Oxford department store last weekend. 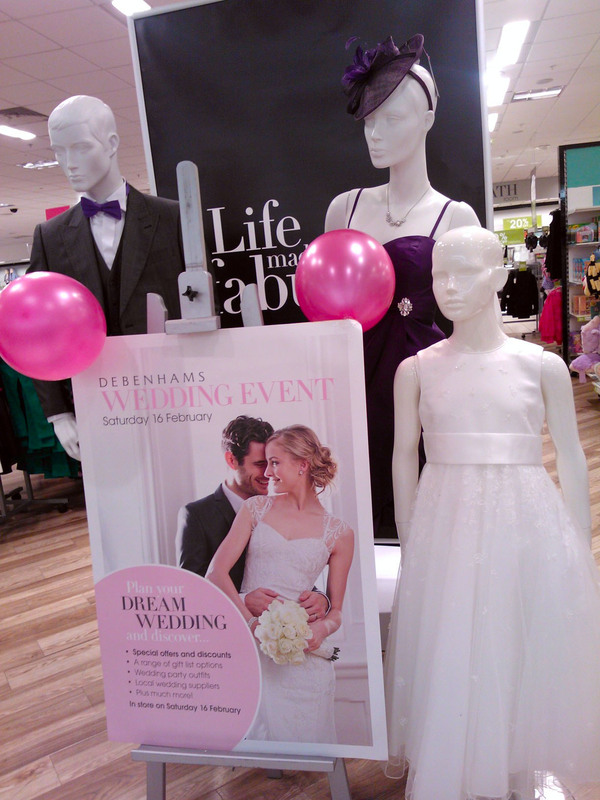 Following hot on the heels of Valentines Day, the traditional British retailer held a Wedding Fair on Saturday 16th February 2013 to celebrate love, commitment – and how to have a fabulous wedding! Dr Sam explains the interpretable nature of a PlayDNA portrait – and why they make such great wedding gifts! As well as the many excited brides and grooms, a busy Saturday crowd kept PlayDNA Founders Dr Samantha Decombel and Dr Stuart Grice chatting about their novel artwork all afternoon. More than one person were stopped in their tracks by the colourful display pieces and paused to admire the ‘extremely cool’ and ‘fascinating’ artworks as they browsed the aisles. As a wedding gift never to be forgotten you certainly couldn’t do better than a PlayDNA portrait – a fun way to see how compatible the bride and groom might be! Do opposites attract? Or are you the perfect match? 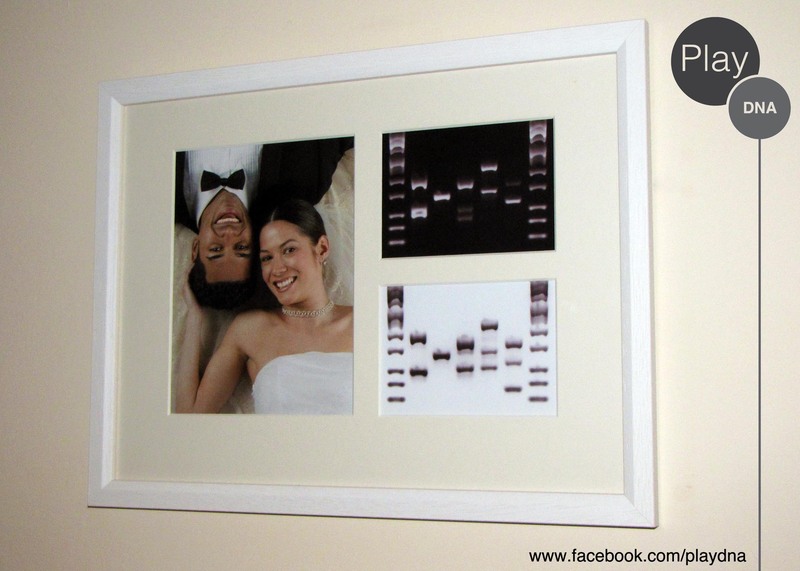 Beautiful genetic portraits for couples and families that come complete with your own DNA analysis and guide. Available now, just contact sam@playdna.co.uk for more information or take a look at our facebook page: http://www.facebook.com/playdna. The perfect finishing touch to your family home, a personalised PlayDNA rug! This might just be one time you’ll be happy to be walked all over! The latest edition to our DNA PORTRAIT product portfolio is probably our favourite so far: the personalised DNA rug. We’ve teamed up with bespoke rug manufacturer and official producer of the Stamp Rug – Rug-Maker.com – to bring this fabulous new product to you. PlayDNA Founder Dr Samantha Decombel and Rug-Maker.com’s Julian Blair discuss the potential of a collaboration to create a new and unique personalised interior option. Following a chance meeting with Sales Director Julian Blair at the 2013 Interiors UK exhibition, Dr Samantha Decombel immediately saw the potential for a collaboration between PlayDNA and Rug-Maker.com, renowned for bespoke handmade rugs perfected through technology. By combining our high-tech science with their high-tech design, we have created a totally unique and stylish concept in soft furnishings and interior design! After preparing your personal DNA art with the PlayDNA difference, Dr Decombel and our talented graphic designer Callie Bowyer work alongside Julian to create the perfect design for your home. 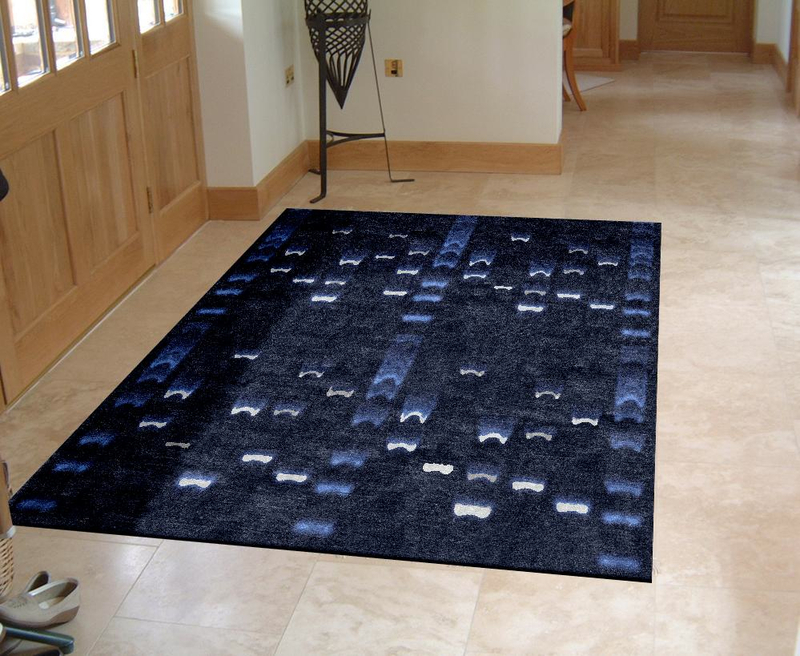 This DNA rug showcases a family of four with every band representing a different trait, such as the gene for eye colour, or whether they are early birds or night owls. Can you spot the family resemblance? We can create a combined DNA portrait for any number of family members! As you would expect from one of the leading custom rug manufacturers in the world, quality is at the heart of this product, with each beautiful rug hand-crafted from 100% New Zealand wool and silk in the Kathmandu valley of Nepal. With prices starting from just £599 (1m x 1.25m) and over 350 colours to choose from, you’re certain to find the perfect rug to add the finishing touch to your family home.